First pictures: new Ford Ka | What Car? 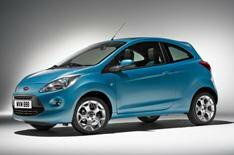 This is the all-new Ford Ka, which is scheduled to go on sale in November from around 8000. Although technical details or engine line-ups have not been released, it is known the new Ka is based on the same platform as the Fiat 500, although it will not share any visible parts with it. The car has several visual similarities to the existing Ka, although its front end and chunky proportions ensure that it stands out as an all-new model. It will be seen in the metal for the first time at the Paris motor show from October 2, and it will also feature in the next Bond movie, Quantum of Solace, which is scheduled to be released in November. The original Ka was launched in 1996, with more than 1.4 million subsequently being built.